Will he mention The Wall tomorrow? I rarely mention politics here – mainly because most of the utterances from our glorious ‘leaders’ have a certain entertainment value, but little else for serious traders. But I just had to laugh when I came across this little gem. The State of the Union speech given by Presidents is an annual event and has been I believe since Washington’s day. This year, President Trump’s message has been delayed by the government shut-down but is due to be given tomorrow. There may be some surprises as Mr Trump delivers and I am on high alert for any, if they should occur. I am sure you know that his promise to build a Mexican Wall has generated heated debate (to put it mildly) – and Congress so far has denied him the funds to carry it out. His predecessor Obama is widely considered to have been a very ‘liberal’ president, but this is what he said in his SOTU message ten years ago: “I think what we have to do is to come together and say, we’re going to strengthen our borders — and I’m going to be going to Mexico, I’m going to be working with President Calderón in Mexico to figure out how do we get control over the border that’s become more violent because of the drug trade. “We have to combine that with cracking down on employers who are exploiting undocumented workers. (Applause.) We have to make sure that there’s a verification system to find out whether somebody is legally able to work here or not. Needless to say, Obama got a free ride with the liberal MSM with that illiberal sentiment! But today, that very same sentiment expressed by the ‘controversial’ Mr Trump is a hot potato. What a difference ten years can make in politics! In the bigger picture, this concern for borders highlights the growing conservatism sweeping the world – and that is a key characteristic of bear markets. Ten years ago in 2008, stocks were slammed in the biggest smash since the Great Depression. And with the still-young bear market today, borders are again a hot issue (see the Brexit Ireland/Northern Ireland border impasse). And the relief rally in stocks continues – at least for now. But valuations remain stretched as tight as a drum. One of the best measures of valuation is the price-to-company sales ratio. And for the 500 issues in the S&P, it reached a high at 2.4 last October at the Dow/S&P ATHs, exactly matching the high at the 1999 stock high. And those with a long-ish memory will recall what happened to shares in 2000 in the Dotcom bust. As shares collapsed from early October last year into the late December lows, the ratio dumped to 1.8 and in January has climbed to a Fibonacci 50% retrace at 2.1. Even at 2.1, it has exceed that valuation only for very brief periods. For most of history, the ratio has fluctuated around the 1.0 – 1.2 mark. In other words, today’s stock valuations are extreme. That is not to say they cannot get any more so, but at some point, they will revert. 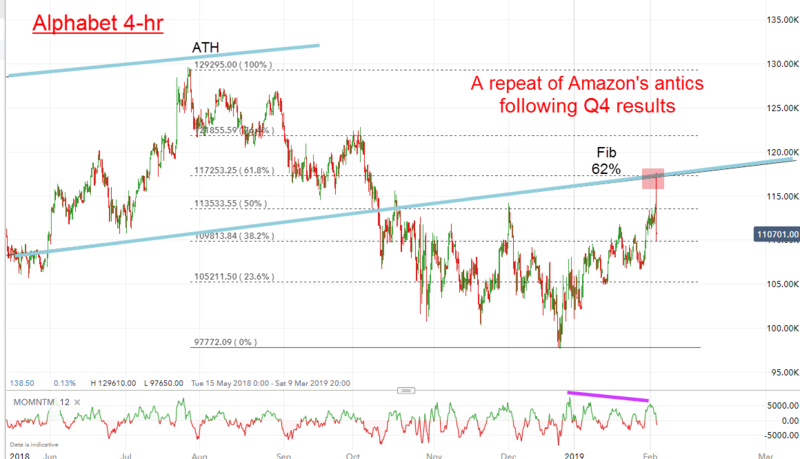 Last time, I showed the reaction in Amazon’s share price right around the time of the Q4 results. 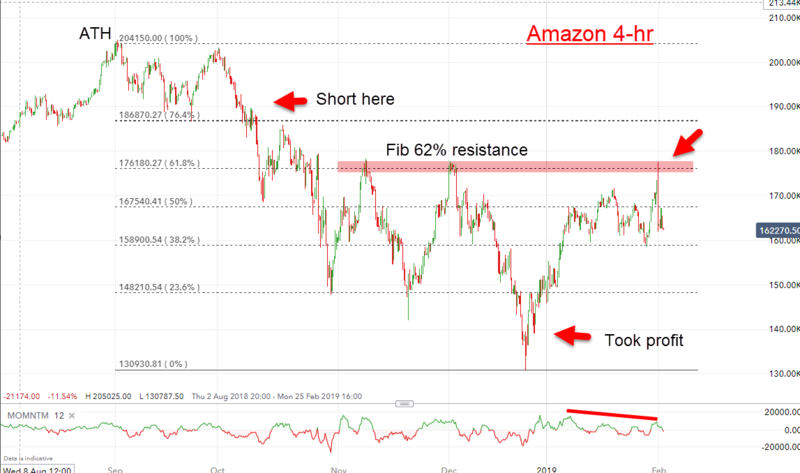 Initially they zoomed northwards to a precise hit on the Fibonacci 62% retrace of the entire wave off the ATH – and then headed south sharp-ish. Uncanny isn’t it? And that is why I love the Fibonacci 62% level! I believe these spikes in both markets are significant and spell the end of the great bull market in tech. 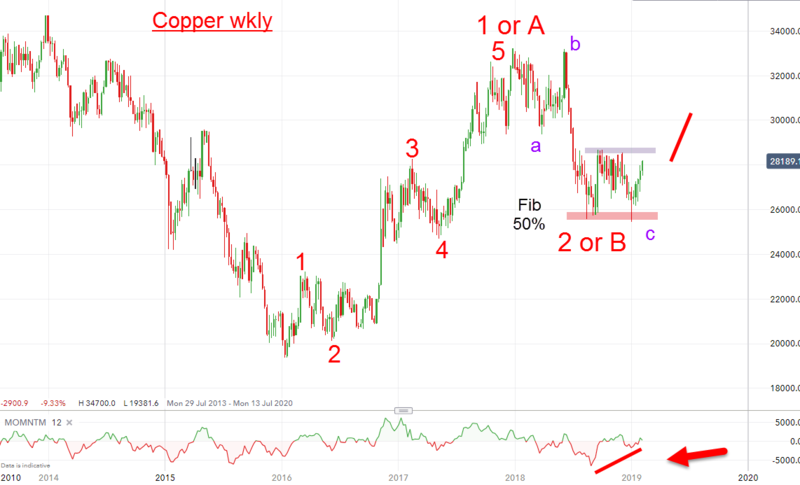 Is Dr Copper trying to teach us something? Copper has the reputation of being a litmus test for the global economy and carries the erudite nickname of Dr Copper. Even today with the services sector taking a larger slice of the GDP pie, copper is still widely used in housing and many industrial applications. Recently, China announced it will embark on another infrastructure stimulus programme – and we know what that means. More empty cities with empty apartments and empty shopping malls. But hey – demand for copper looks set to jump. From the low two years go at the 1.9 cents level, it advanced in a clear five up to the 3.3 cent high one year ago. The five up indicates the main trend is up. And last year, it entered a normal three down correction to the Fibonacci 50% support level on a huge momentum divergence. It is currently rallying strongly and about to test the resistance ahead. We are either in wave C or wave 3 with the former as my best guess. The bottom line: Copper is in an uptrend and that implies continued support for shares – at least for now. Are these being snapped up? 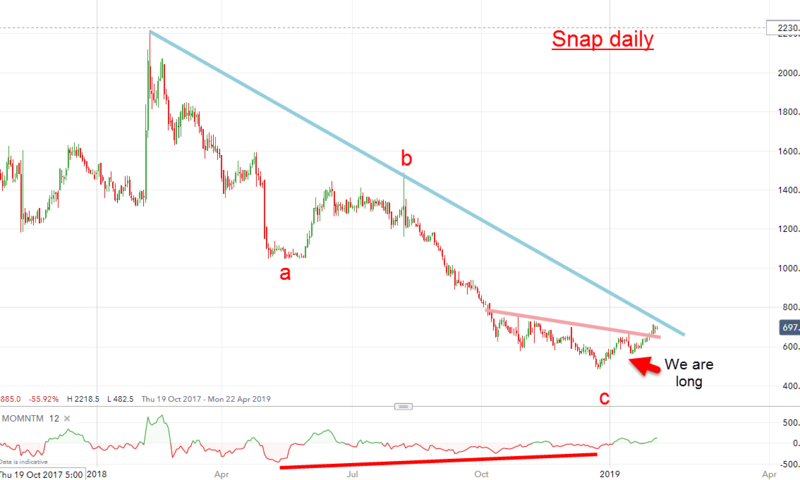 Snap Inc has been a forgotten member of the Silicon Valley social media set compared with Facebook, WhatsApp and Instagram. And the shares have certainly suffered with a massive decline from $22 a year ago to the recent low sub-$5. It must be one of the most un-loved US tech companies on the board. And that is precisely why I started taking an interest. Noticing the large momentum divergence, I advised PRO SHARES members to go long in what I considered a low risk/high probability trade. And now, we are pushing up to test the minor pink trendline at the $7 level. A sharp break above the major blue trendline would bring my target at the $10 heaving into view.